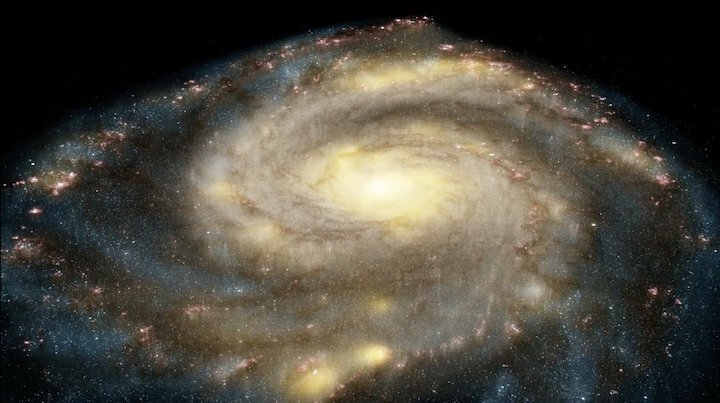 The Whirlpool galaxy, seen here in a still from a NASA video, stars in a stunning new visualization that combines observations from the Hubble and Spitzer space telescopes and Chandra X-ray Observatory. Three powerful space observatories reveal the Whirlpool Galaxy as a wonder of star formation and star death in a new video from the Space Telescope Science Institute, which performs the science operations for the Hubble Space Telescope. The 3-minute series of images opens with a stunning visual-wavelength view of the galaxy, a supernova (star explosion)-rich zone that lies about 30 million light-years from Earth in the direction of the northern constellation Canes Venatici. The Whirlpool Galaxy is officially known by astronomers as M51 or NGC 5194. The video steps through different wavelength observations of the galaxy in visible light (Hubble), infrared light (Spitzer Space Telescope) and X-rays (Chandra X-Ray Observatory), explaining what each space telescope shows astronomers. Different wavelengths can also reveal the overall structure of the galaxy, the video explains. Embedded in the center of Whirlpool is a supermassive black hole, which emits powerful X-rays. Cool gas and dust in the arms shines in infrared temperatures, revealing the galactic structure. Meanwhile, hotter gas in stellar nurseries shows the presence of supernova explosions, which heats the gas to high temperatures. "The contrasting features seen in multiwavelength studies greatly enhance our understanding of galactic structure," the video concludes.